Joyful Noise – Joyful Movie! Yes, it is a feel good movie. Yes, the plot has no real surprise. However, Queen Latifah and Dolly Parton are magic up on the big screen. The return of Parton to film is especially nice since she simply lights everything up with her charm, sense of humor and winning country sounding voice. The comedic team she and Latifah make is great. I like to see them do other projects together. The story follows the story of a church choir from a hard economically hit small Georgia town and their quest to win the National Choir competition in Los Angeles. Their choir director suddenly passes away. 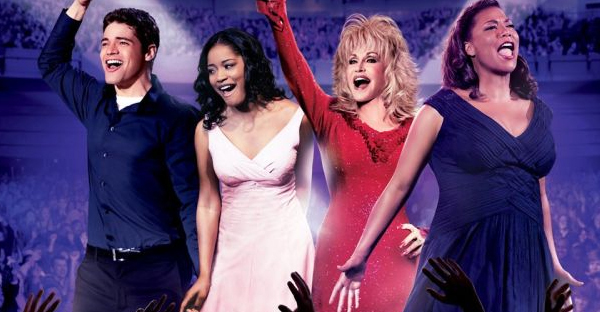 Latifah’s character takes over while the choir director’ widow ( Parton) spars with her throughout the movie over the choir’s direction and other things. There is young love and other sub plots. There is also lots of rocked out gospel singing which keeps you moving in your seat. The movie may not win an Academy award but it is certainly has a lot of heart. One that would leave you feeling a lot more “joyful” and glad that you spent a few dollars to be entertained by Dolly Parton and Queen Latifah.